Canister filters are one of the most efficient filtration systems available for aquariums and one of the best ways to ensure an optimal environment for your fish to thrive in. They’re recommended for tanks both large and small, and suitable for everyone from the amateur hobbyist up to enthusiastic expert fish keepers. Depending on make, model and what filtration media you decide to use, biological, chemical and mechanical filtration are possible with a canister filter. So crystal clear and healthy water can easily be achieved with a quality model. In this article we give buying advice on the best canister filters available in 2018. We discuss the advantages of canister filters over types, how they work, what to look for and what to avoid when shortlisting models, and eventually list and detail our top 5 choices and recommendations. Note: The links above take you to more information, current prices and customer reviews on Amazon. What are The Advantages Over Other Filter Types? What Types of Tank and Fish are Canister Filters Suitable For? How Long Does a Canister Filter Last? What Should You Be Looking For When Buying? Can You Use Them in a Saltwater Aquarium? A canister filter is large and sits external to the tank, usually hidden within the tank stand, or off to the side. Generally speaking, due to their high power and high amount of water filtered per hour, they are generally speaking suited to large tanks with a few inhabitants. Being so large, they have plenty of room inside for different types of filter media, making them able to perform all three types of filtration – Mechanical, biological and chemical – or any combination thereof. They do require a little more work to set up and maintain and are a bit more expensive than other filter types, but you do get what you pay for. They are one of the very best types available and are an excellent choice for any aquarium. In short, canister filters work by continually pumping water out from the tank into the canister and running it through various stages of filtration media in order to purify it before pushing it back out into the tank. A canister sits outside the tank, with an intake tube for drawing water out of the tank, and a return tube, usually complete with ‘spray bar’ for returning water to the tank. Water is sucked from the tank via a siphon effect aided by gravity, into the canister, before a large and powerful pump forces the water through stages of filtration and eventually back out into the tank. The different stages of filtration available within a canister filter are Mechanical, Biological, and Chemical. Mechanical filtration is effectively forcing the water through a sponge-like material that traps solid particles, effectively sieving the water of debris, uneaten food, and solid waste. Biological filtration uses materials such as ceramic rings, to provide a vast surface area for beneficial bacteria to colonize, that feed on toxins such as ammonia and nitrates, turning them into safer by-products and hence maintaining safe water parameters for your fish. Chemical filtration is the addition of chemicals into your aquarium water to directly act upon impurities, trace chemical elements, remove medications and so on. The final stage of the filter is the return pipe, usually, with a spray bar attached, that returns clean water into the aquarium for fish to enjoy, while also creating little currents in the tank to prevent ‘dead spots’ where stagnant water can collect. Canister filters are significantly bigger and more robust than other types such as internal or ‘hang-on-back’ (HOB) filters. The extra size actually increases the volume of water present in the system – that in the tank, and that held in the canister. The more water there is, the more stable the parameters are and lower the concentration of impurities. Due to their size and power, They are highly efficient in comparison to other types, as they’re able to filter a large amount of water quickly, reducing waste in the tank much faster. They offer an owner the chance to customize the internal filter media, allowing any combination of biological, mechanical and chemical filtration desired, to match the exact requirements of your aquarium or what you are currently trying to achieve. They just look better – or should I say, are invisible. Aesthetically, canisters are preferable to the intrusive ‘hang-on’ filters or any internal types, as they are usually stored externally – say in a nearby cupboard, hidden inside the cabinet supporting a tank as a stand or on a shelf. They are suitable for all tank types and shapes. Where other filters may only be suited to a particular aquarium type, size or breed of fish, the best canister filters are a good choice regardless of tank size and inhabitants. Quality models will also fit both fresh and saltwater habitats. They last longer, provide more powerful filtration and require less maintenance to function effectively. They also run very quietly so won’t prove a disturbance in quieter rooms or spaces. Comparatively, they are more expensive than other types – depending on the make and model – but are generally considered to be good value for money as they have a long shelf-life and offer superior cleaning and filtration. Secondly, they do require a little extra work when it comes to maintenance being larger and containing more filter media than most other types. However, once you get into a routine and have cleaned them a few times, honestly, it’s very easy and not at all painful. Although they would probably be considered overkill for a very small aquarium (say, a 5-gallon fish bowl), they are a worthy addition to any decent tank from small to large. Depending on your aquarium size, you can buy different sized canisters with corresponding flow rates to best suit the size of different tanks. They are also a good choice regardless of whether you have a freshwater or saltwater aquarium. Just be mindful to check if the EXACT model you’re buying is best suited for one or the other in order to guarantee its longevity. Sizes vary from model to model and many companies offer a range of canister sizes to fit different sized aquariums. The bigger the aquarium, the bigger the canister required is the general rule of thumb. Before buying a filter, check the Amazon listing for the specific dimensions of individual models to make sure it fits in the space you have allocated for it. Their longevity of really does depend on how well they are looked after and maintained. If you follow a good maintenance routine and are willing to buy new parts as and needed, then they can last in excess of a decade. The good thing about them is, almost all parts are exchangeable. Something breaks, you only replace that part and not the whole unit. So you get great value from them over the long term. The impeller motor, rings and rubber gaskets are the most likely parts to wear out and require replacing but all are easily and affordably obtained from pet supply stores and, of course, the Internet. Maintaining canister filters is generally easy depending on the model, although you will need to commit to cleaning and replacing the filtration media occasionally to guarantee the efficiency of the filter. As with any filter, you will need to replace any carbon regularly as it can release toxins if it gets too clogged with waste. See the guidance of the particular model you choose to get a firmer idea of replacement times. The tubes and pump of the canister will also need regular cleaning between once and three times a year – again, check your particular filter’s own guidance. Cleaning kits may be included when you buy, or you can easily obtain one online or at most local pet stores. Size of your aquarium and flow rate: Canister filters are rated according to the size of tank they can service, based on the flow rate. We recommend buying a model suitable for a tank at least twice the size of the one you have. This is because during use, when filled with media that becomes clogged over time, the flow rate will dramatically fall and this will keep you safely above what’s needed. so if you’ve a 20 gallon, buy a filter for a 40 gallon+ tank. The functionality: Is it suitable for freshwater or saltwater tanks? Or both? Size and flow rate: Ensure that the canister is big enough for your aquarium; they are priced and sized according to gallon-capacity. Good filters will cycle the aquarium’s volume around four times in the space of an hour; so that would be 120gph (gallons per hour) for a 30-gallon tank, say. Whether a pump or self-primer included: Canisters work by pressurising water into the filter through the use of a pump. While most models will include one automatically, cheaper models may have you buy one separately or you will need to siphon the water manually. Ease of maintenance: Check how easy it is to install, how often it’s recommended you clean the product and how readily available the replacement parts are. Is there any filtration media included: Check if it comes already equipped with biological, chemical and mechanical media. How customizable is it: Are you able to pack and stack the media as you desire? Is the flow rate adjustable? Accessories – Are there any available? : For instance – diatomic sleeves, sponges, extra rings for additional filtration, a spray bar, intake strainer and spare tubing. Canister filters are used by smart fish keepers who want the best filtration possible and to be able to customize the mix of filtration media held in the internal baskets to suit their specific tank. They are the best type of filter available and the type we most recommend on this site. We’ve used many a filter ourselves and have scoured the internet for reviews and information on dozens of different models, looked at the pros and cons of each and picked the best 5 models to show you below. Fluval are one of the best known and best respected aquarium brands available. 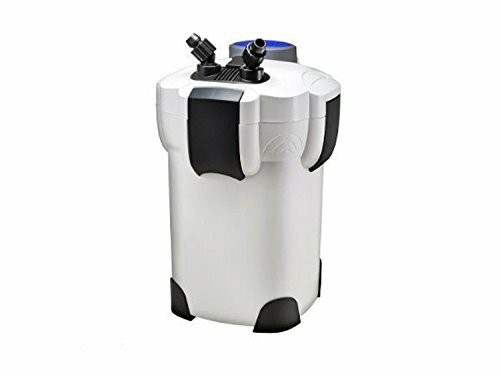 This external filter is available in four different sizes; up to 25 gallons with 145gph, up to 45 gallons with 206gph, up to 70 gallons with 303gph and up to 100 gallons with 383gph. The x06 range comes complete with hoses and hardware to hook it all up as well as biological, mechanical and chemical filtration supplied in the internal baskets and so is ready to go when shipped, no other accessories required. The Fluval x06 range has the perfect blend of price and features, an efficient and ready to go complete kit Not the cheapest but far from the most expensive. What you get for the price makes these the best canister filter choice for most people in our opinion. They are suitable for both freshwater and saltwater aquariums. It has multiple and removable filtration baskets for you to customize the filtration process, and comes with mechanical, chemical and biological media. With a clog-proof intake strainer and double layer foam screen, more debris is absorbed quicker. A complex water flow path means that the aquarium’s water enjoys maximum contact with the media so is more efficiently and minutely filtered. It holds 35 to 50% more water than similarly sized round canisters, so water is filtered quicker. It is suitable for both freshwater and saltwater tanks. It runs very quietly with its special sound-dampening motor impeller design. It’s very sturdy and equipped with an Aquastop valve, lift lock clamps, class fibers and rim connector assemblies. 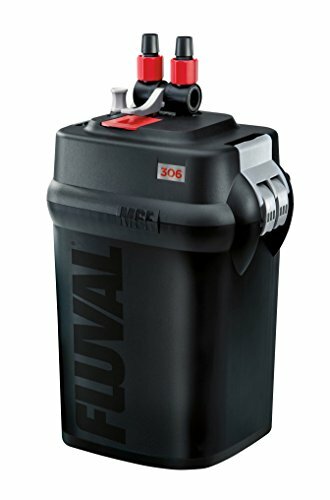 Fluval are so confident of its quality that they offer a 3-year warranty on the product. Start-up is instant with a self-primer. Maintenance is easy too as the filter opens easily and quickly clamps down to lock. It has an adjustable flow rate. It comes ready to work straight out of the box – there’s no need to buy any extras. The color of the intake tube and seals is white, showing up grime and algae residue easily. EHEIM are another big name in the canister filter world and this ‘Classic’ model has been providing dependable filtration to thousands since it’s initial release 3 decades ago. This Eheim is a single chamber design, making it easy to clean, maintain and exchange filter media to suit your individual requirements. And it comes complete with Eheim Mech and Substrat pro mechanical and biological media as part of the kit. It also includes a spray bar to attach to the inlet tube with every purchase. Known for having a solid and long-lasting build, this model should last you many years. For example, many canister filters start to leak after a time, a big reason being the somewhat weak plastic clamps that hold the power head to the canister tank. With this Eheim, there are strong stainless steel clips that will not weaken with time. This filter often garners comments on its quiet operation, so that’s important to you, this model should undoubtedly feature on your shortlist. This model is available in the following sizes: For up to 40-gallon tanks, up to 66 gallons and up to 92 gallons. It’s a very efficient model with constant water circulation around the huge canister chamber and no bypassing of any of the multi-stage filtration. The filter pads and carbon pick up both coarse and fine debris quickly and efficiently. It’s a high quality, heavy-duty product with easy and safe closing and a leak-proof permo-elastic silicon-sealing ring on the pump head. It comes with a host of accessories: namely, a spray bar, sponges, inlet pipe, valves, tubing and a hose. It also comes with mechanical and biological filtration media. It runs more or less silently. It’s very compact in size and is rendered tip-proof by its stand. It works with salt and freshwater tanks. You can’t adjust the flow rate although you can adjust the direction and reduce the strength of the current with the included spray bar. Penn-plax is a very popular manufacturer of pet products, catering to owners of birds, cats, dogs, small animals and of course aquarium fish. They enjoy a large volume of sales each year, and receive good overall customer feedback. Up to 200 gallons and 350gph flow rate. It features a very sturdy, tip-proof base that will go a long way toward preventing some of the almost inevitable spills. A push button primer that’s incredibly easy to operate means startup couldn’t be simpler, compared to some other models with their somewhat flimsy – and I might breakable – plungers. Also, two independently movable and 360-degree rotating valves mean the ultimate in filter placement, with no struggling to bend tubes into the right angles required. With every purchase comes a spray bar and filter media included in the kit, so it’s ready to go without further purchases. It offers multistage filtration with large stackable trays of mechanical, chemical and biological media so you can customize as you see fit. Mechanical, chemical and biological filter media are included. You can adjust the water flow rate with the included cut-off valves and quick-disconnect tubing. It also comes with a spray bar so you can adjust the direction of the current. It self-primes easily so there’s no need for manual siphoning during installation. It’s very sturdy with a tip-proof base, locking clamps and a motorhead with an integrated o-ring. The included tubing is quite stiff so may require some elbow grease when it comes to connecting and installing the filter. 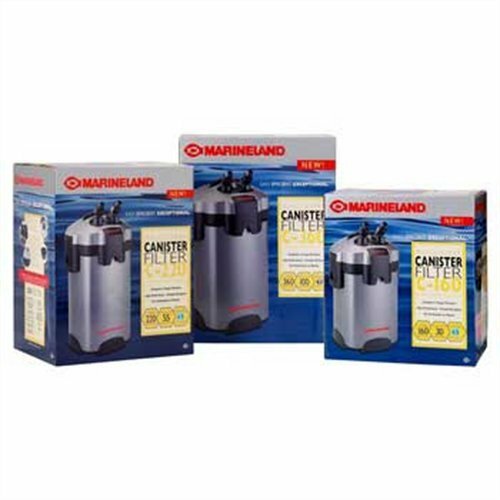 Marineland is another ubiquitous manufacturer in the aquarium world, catering to all types of fish keeper with a wide and varied product range that’s proven to be good quality, effective and popular. This model is available to suit aquariums in the range of 30 to 150 gallons, with flow rates from 160 to 530 gallons per hour. They have 4x media baskets and sell a wide range of different mechanical, biological and chemical media to fit, so you can customize this filter to suit and set up you may have. Handily, it comes with media included so you can be set up and running without further purchases. It boasts the most powerful flow rate of our top 5 models, meaning quicker filtration. It has a 3-stage filtration process with biological, chemical and mechanical filter media types included. There’s no bypass option and a 100% water to media contact rate, ensuring crystal clear water and the effective removal of odors, discoloration and impurities. The media slots are replaceable and it comes with stackable trays so you can customize the filtration method to your own preferences. It primes instantly with no need for manual siphoning. It has an intuitive set-up and disassembly with printed instructions and a DVD. Everything needed for set-up is included in the box. The filter requires little in the way of maintenance: the ceramic rings and BIO balls only need replacing if they get damaged while the activated carbon and polishing pads should be replaced monthly. Cleaning the tank is easy with lift lock clamps, an intake strainer and heavy duty hoses. It works in both freshwater and saltwater tanks. It’s very sturdy yet runs quietly. A relative newcomer to the aquarium world, only having been around for a few short years, SunSun has certainly made a splash, particularly in the budget equipment world, gaining quick popularity and high sales volume in a short amount of time. And judging my the positive feedback they receive, I would imaging they are also here to stay! SunSun’s no-frills HW3xx series canister filter is cheap in comparison to most of it’s competitors on this list, while still providing an excellent level of filtration and reliability. It comes complete with filter pads, hoses and all parts necessary to get started, however in our opinion, you really will have to make an additional purchase of SunSun’s bio-balls, or another biological media to establish a decent cycle, establish and keep stable and safe water parameters. So please do take this extra cost into account when comparing against your budget and pother models. It is incredibly good value in comparison to other canister filters on the market while still offering a high standard of filtration. It has 3 large media trays to allow for biological, chemical and mechanical filtration according to your own preference. It comes with filter pads and hoses for a quick and easy setup. There is also a self-priming pump. It comes with an adjustable spray bar so you can adjust the direction of the current. You will need to buy biological, chemical and mechanical filter media separately. (Though for a small additional cost there is a kit available). The set-up instructions are quite generic – though again, it’s not difficult to set up..
As a consequence of the lower price, the plastic structure feels a little less sturdy than its competitors. Unpack everything and be sure all the parts are present. Find a spot at least 8 inches below the tank to place the canister, and ensure there is a clear path for the hose to reach the water. Fill the media baskets starting with mechanical media first, followed by biological, and finally chemical. Attach the intake hose, run it to the water, and cut to length; it should be at least 3 inches from the bottom. Do the same for the output hose, making sure it reaches to at least 1 inch below the waterline. This will depend a lot on your tank and the fish you keep. Basically, if the filter looks dirty or the water flow is reduced, it’s time to clean. The time between cleanings will probably average about once every 6-8 weeks. Heavily populated tanks may need monthly cleanings, but some aquarists go as long as 3 months. Turn off the power and wait for water to stop flowing. Once the tubes are empty, engage the shut-off valves to prevent leakage before disconnecting the tubes. Take the filter to a sink or bathtub and remove the motor housing and all removable parts. Use a scrubbing brush (like an old toothbrush) to scrub each piece while you rinse. Be sure to clean the impeller as a lot of gunk will accumulate here and reduce its performance. Also clean out all intake/output holes. Rinse the media in each tray. You may want to set biological filters in a bucket of aquarium water to preserve the bacteria which are beneficial to your tank! Rinse out the canister itself and then reassemble. Dry off the outside of the filter housing and ensure the seal is watertight. Return the filter to the tank and reconnect the hoses and power supply. Not all canister filters prime the same way. Some are self-priming, and all you need to do is hook them up and turn them on. Others have a priming button on top – You pump it repeatedly to prime the canister. Canisters without built-in features will need manual priming. With the canister dry, insert the intake hose into the water. Create suction with a suction pump (some people use their mouths) inserted into the output hose until water is drawn up the intake tube and over the edge of the tank. Water should now be flowing through the system. Once the water makes it all the way through, you can start your filter. Unpack your canister filter and remove all packaging. Open the housing and take out everything inside. Inspect for cracks, and make sure all parts are present. Load your media trays and install all filter trays in the canister. Find a spot for the canister below the tank on a shelf or in a cabinet, then connect it to the power. DO NOT TURN IT ON YET! Position your intake and output hoses where you want them on the aquarium, feed them down to the canister, and trim for length. Connect the hoses and open valves. 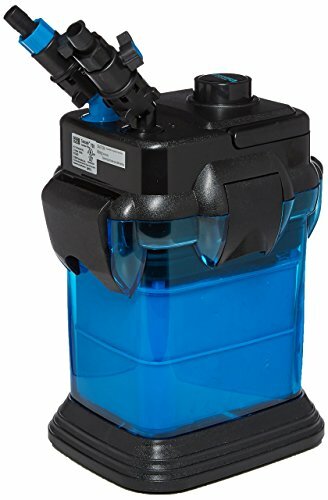 Only now, and with water in your aquarium that can run through the filter, do you prime the canister and turn on the pump. Please, do not turn on your filter if there’s no water for it to pump, this can lead to damage. Yes, you can use a canister filter on a saltwater tank, either on its own or in partnership with another filter. Be aware that you may get nitrate build-up unless you perform weekly cleanings. You can also try eliminating the biological filters to cut down on nitrate, especially for a reef tank with sufficient live rock. The clear winner is undoubtedly the Fluval External Filter. Its level of filtration is unparalleled with such innovations as a complex flow path, multiple, customizable filtration baskets, an adjustable flow rate, large capacity and unsurpassed ability to catch debris. It’s easy to install and maintain, and is supremely sturdy with a guarantee for longevity to boot. The Fluval is ready to go out of the box and comes equipped with high-quality filter media. You know you’re choosing quality when you opt for a Fluval and the model’s reams of satisfied customers speak for themselves. It’s our top recommendation! This article contains affiliate links that when clicked, if you then go on to purchase anything, results in ItsAFishThing.com receiving a small affiliate commission. This has no effect on the eventual price you pay. But we are sincerely grateful for your support.